Katie O’Reardon gladly surrendered her mortal soul to the darkness. Now better suited to avenge the deaths of her family, she is eager to aid those who helped her survive. Before facing a monster who hopes to use her as a pawn in his evil game, she must first prove to Tristan that she’s prepared for the battlefield—and ready to be the match for this knight’s everlasting heart. 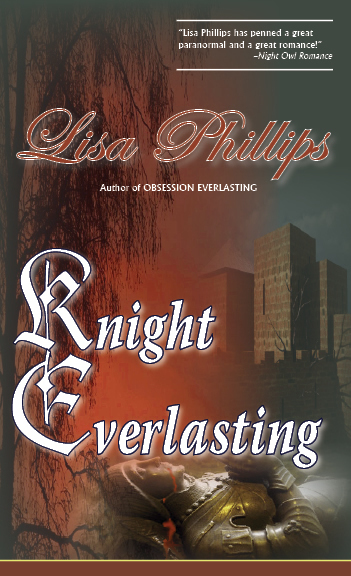 “Knight Everlasting is the follow up to Lisa Phillip’s Obsession Everlasting and never having read the first book, I was a little worried I might be lost when reading this new one, but that wasn’t the case. Ms. Phillips does an excellent job of inserting just enough back-story at the appropriate times to keep the reader informed and the plot moving forward. Fraught with both internal and external conflicts, Tristan and Katie’s romance was a joy to watch unfold. The story sizzles with sensual tension and a couple of well-placed scenes had the pages blazing.